They have been shown to improve digestive health, promote heart health, reduce depression and improve your skin’s appearance. 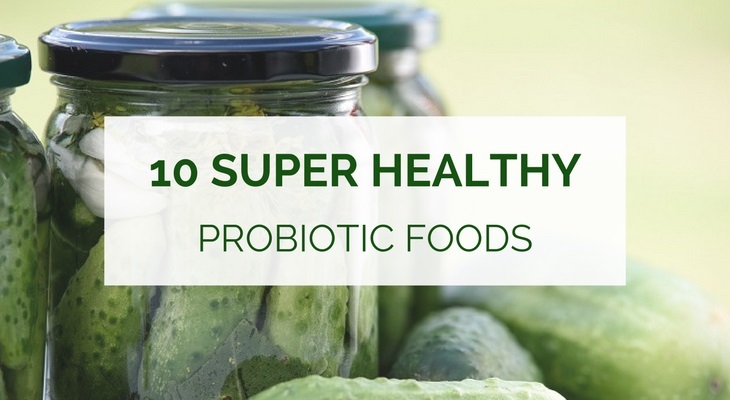 You can opt to get probiotics daily through supplemental intake or you can add certain foods to your diet that are prepared by bacterial fermentation. There are several popular food options that can be easily added to your meal plan to increase your natural intake of healthy and beneficial bacterial strains. Possibly the most popular and well-known probiotic food is yogurt. It is easily one of the best sources for probiotics that can help improve your health. Yogurt is made from fermented milk, using friendly bacteria such as lactic acid bacteria and bifidobacteria. Studies have shown that eating yogurt is linked to several health benefits including improved bone health, as well as support for those with high blood pressure. Yogurt can even reduce diarrhea that is caused by antibiotics in children and relieve the symptoms of irritable bowel syndrome. Yogurt is easier to digest for those with lactose intolerance, so it can replace milk for daily dairy intake requirements. The bacteria in the yogurt turn some of the lactose into lactic acid which is easier to digest and gives yogurt the slightly sour taste. You need to be sure you choose a yogurt that contains live cultures, because not all of them do. In fact, many yogurts sold have had their probiotics killed during processing. Read the label before you buy and check for live cultures as well as labels such as low-fat or fat-free. These may contain high amounts of sugar, which allow bad bacteria to thrive in your gut. Not liked by everyone, sauerkraut is a shredded cabbage that has been fermented by lactic acid bacteria. It is one of the oldest traditional foods and is very popular in many countries, especially across Europe. Many use it to top sausages or as a side dish and its salty, sour taste is definitely one to try. Apart from the probiotic qualities and benefits it provides, sauerkraut is also rich in fiber, as well as vitamins C, B and K. It is also high in sodium and contains iron and manganese, all of which are essential to health. Be sure to get unpasteurized sauerkraut because the pasteurization process kills live and active bacteria. This is a fermented probiotic milk drink made by adding kefir grains to milk. The grains are not to be confused with cereal grains, as they are actually cultures of lactic acid bacteria and yeast that strongly resemble cauliflower. Kefir has been linked to several health benefits including helping with digestive problems and protecting against infections. Yogurt may be the best known probiotic food, but kefir is the best source because it contains several major strains, making it the most diverse and potent. This Japanese seasoning is made by fermenting soybeans with salt and a fungus called koji. Typically found in the form of a paste, it is most commonly used in miso soup, which is a popular breakfast food in Japan. Miso is a great source of protein and fiber and is also high in several essential vitamins, minerals, and phytonutrients such as vitamin K, manganese and copper. Studies have linked miso with several health benefits including improved digestive health, as well as lowered risk of breast cancer and stroke. Another soybean product, tempeh is a fermented soybean patty that is described as having a nutty taste, or similar to a mushroom. Originally from Indonesia, tempeh is now a widely used substitute for meat products because of its high protein content. Soybeans are usually high in phytic acid, which impairs the absorption of minerals like iron and zinc. The fermentation process lowers this acid, which makes tempeh helpful to boost the absorption of certain minerals in the body, which leads to overall improved health. Kimchi is a fermented, spicy Korean dish in which cabbage is the main ingredient, often prepared with other vegetables. Flavor is added using red chili pepper flakes, salt, scallion, ginger, and garlic but the beneficial ingredient is the lactic acid bacteria. This bacterial strain is responsible for improving digestive health. In addition to this, the cabbage used is high in vitamins and minerals such as vitamin K, B2 and iron. Buttermilk refers to a range of fermented dairy drinks but there are two main types; traditional and cultured. Traditional buttermilk is the leftover liquid from making butter and it contains probiotics. The cultured buttermilk found in most stores does not have any probiotic benefits so be sure you get your hands on the traditional variety. Not only is it low in fat and calories, but it contains many beneficial nutrients. Cucumbers that have been pickled in a water and salt solution are actually good for you, as well as tasty. They are fermented using their own lactic acid bacteria which is what gives the sour taste. Pickles are a great source of healthy probiotic bacteria, which improves digestive and gut health. Be sure to avoid pickles that were made with vinegar however, because these will not contain any helpful probiotics. Another fermented soybean product like tempeh and miso, but not as well known is Natto, popular in Japan where it is served with rice, traditionally at breakfast. Natto contains probiotic benefits, as well as protein and vitamins. Natto has been linked to improved bone health, cardiovascular health, and possible prevention of osteoporosis. Or more accurately, some cheeses. Most cheese is fermented but that does not mean they all have probiotics. You need to check the labels before you buy to make sure you get a cheese with live and active cultures such as Gouda, mozzarella, cheddar, and cottage cheese. Cheese also contains protein, as well as many essential vitamins and minerals, which can potentially be helpful in lowering the risk of heart disease and osteoporosis. Emma works with 1MD, a leading provider of doctor-formulated joint & digestive health supplements.